CHICAGO -- Lawyers for a white Chicago police officer who killed a black teenager presented an animated video to jurors on Tuesday that aimed to depict the officer's perspective during the shooting and support his claim that he feared for his safety when he shot Laquan McDonald 16 times. Prosecutors, meanwhile, focused on the video's apparent inaccuracies. 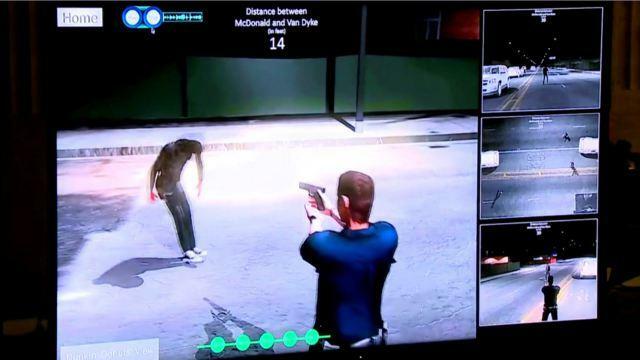 The animated video is aimed at countering graphic police dashcam video that shows Jason Van Dyke shooting the 17-year-old McDonald as the teen holds a knife and walks away from officers in 2014. Van Dyke continued to shoot for more than 10 seconds after McDonald crumpled to the street. The dashcam video, released a year after the shooting, is the centerpiece of the state's case against Van Dyke. But it was recorded from a different angle than Van Dyke's view - from the side of the officer and behind McDonald. What the officer saw during the incident could be critical during his murder trial, as jurors try to determine if it was reasonable for the officer to view McDonald as a threat. The animation created for the defense by California-based 3-D Forensic looks similar to a gaming video. At one point, it depicts a view as if a camera were hovering just over Van Dyke's shoulder. The officer figure shoots as an animated figure representing McDonald seems to look at the officer. The video also offers aerial and other views. The company's CEO, Jason Fries, described to jurors how it was made. When a defense lawyer asked Fries if the animation of McDonald was "closing the distance on Van Dyke," a prosecutor objected. The defense attorney rephrased the question, and Fries responded: "Yes, our analysis demonstrates Mr. McDonald was getting closer to Officer Van Dyke." During cross-examination, prosecutor Marilyn Hite Ross noted the animation depicts Van Dyke shooting just five times when there's no dispute he fired 16 times. Ross also argued that a dark red line highlighting McDonald in the animation made him look taller than he was in real life. She suggested that lead defense attorney Dan Herbert was heavy-handed in how the animation should turn out. She asked Fries: "He gave you specific direction about what he wanted you to do, correct?" Fries denied that. But he did concede he relied entirely on information defense attorneys passed on to him in crafting the digital recreation. CBS Chicago reports that the prosecutors pressed Fries on the animation, saying "it's not real." The judge later recessed for the day. The defense will resume calling witnesses Wednesday. CBS Chicago reports that outside of court, gang member turned activist William Calloway called for a gang truce ahead of any verdict in the trial. "I want everyone in the city of Chicago to put the guns down. All the gangs inside the city of Chicago, I am calling for a citywide peace treaty. We want the gangs to put the guns down and join our fight for social justice," he said. It's unclear if Van Dyke plans to testify during the trial. His attorneys may see the animated video as a substitute for any direct testimony that would expose the 40-year-old officer to potentially blistering cross-examination by prosecutors in a case that has also put a spotlight on the Chicago Police Department . Earlier Tuesday, Van Dyke's attorneys called probation officer Dina Randazzo, who testified that McDonald had become "combative" during a juvenile hearing in August 2013. The testimony came a day after three county employees told jurors about physical altercations with McDonald, who had slashed the tires of a police car before Van Dyke arrived at the scene of the 2014 fatal shooting. Defense attorneys have focused on McDonald's behavior in past years and the day he was killed. Under Illinois law, defendants who claim self-defense can present evidence about the past behavior of the person they killed, even if they weren't aware of that history when the killing occurred. Prosecutors rested their case last week. Defense attorneys started presenting their case Monday.